Original alumminium opneble porthol with two docs. This phorthol is a original ships porthol of Japan ships . It is use to make a decoration and retail environment . We brought from ALANG SHIPS BREKING YARD (INDIA).So it's a original porthol. 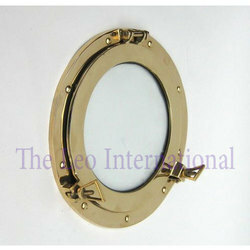 We Offering Nautical Solid Brass Ship's Porthole 12" Window Oval Glass Maritime Wall Décor. Solid Brass Ship's Cabin Porthole Window 12" x 9"
This nautical solid brass Porthole Window has a oval width of 12" x 9" height and is 2.75" deep. The glass oval window is approx. 9.5" x 5". To supply the ever rising needs of our customers, we are occupied in offering a wide range of Brass Porthole. 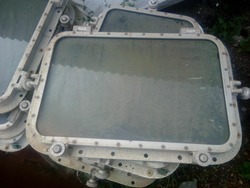 We are offering our client an excellent quality range of Stainless Steel Portholes. These Stainless Steel Portholes are made from very high quality stainless steel raw material which ensures high durability at its user end. These Stainless Steel Portholes are available in various designer patterns and designs. With firm commitment to quality, we are trading, supplying and exporting Port Hole. All our offered products are made in adherence with the international quality standards. Before the end delivery, these are thoroughly checked by the quality analyzers on varied Paterson to ensure their defect-free nature. The Aluminalia Porthole is something that is sure to fulfill every clients expectations. Superior quality with a careful and intelligent design, it is a winning product for the likes of architects, builders quantity surveyors, carpeters and fitters. The Aluminalia Porthole has been designed as a complete solution in itself. Being one of the trusted organizations in the market, we are indulged in providing a wide range of 9 Inch Aluminium Porthole.